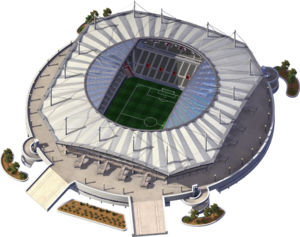 The Seoul World Cup Stadium is a downloadable Landmark Building for SimCity 4 Rush Hour/Deluxe, released as the Plugin Pack 005 free Downloadable Content. It is a recreation of the Seoul World Cup Stadium in Seoul, South Korea as it appeared in 2003. The News Ticker fluff entry created on its placement is "#city# Residents Get A Kick Out Of Seoul World Cup Stadium". At a massive 15x15 tiles in size, Seoul World Cup Stadium is the largest Maxis-Made landmark for SimCity 4 and the largest building made by Maxis based on ground coverage and despite this, it is still underscaled. This page has been accessed 10,590 times.